Today we are very happy to present a make-up collaboration between Sarah-Jane from Makeup by Sarah-Jane and Nicole from Nicole’s Beauty blog. We are both beauty bloggers, passionately in love with make-up and because of our similar taste we thought of doing collaboration and show our make-up tricks by following the same theme. We chose to do a 50’s pin up style theme, where each one of us will show you our own take on this theme. I am very happy to do this theme because it is a style I like very much and have been doing this type of make-up for a while now. 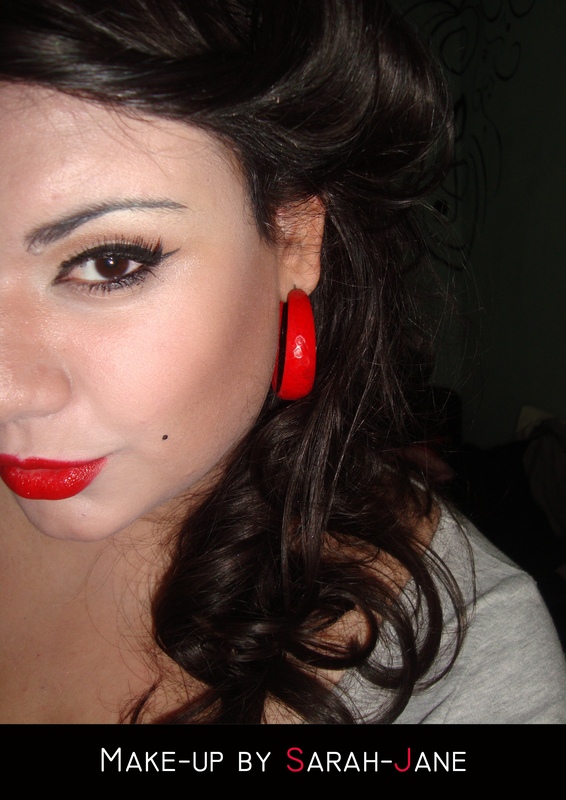 50’s pin up was all about heavy eyeliner, long lashes and red lips. They didn’t have the products we have nowadays so they eye-shadow was very simple, and they focused mostly on the lips. 2. Secondly I use a medium darkness shade of brown from the e.l.f palette and applied it on the inner crease and outer lid of the eye. 3. Then I applied heavy catlike eyeliner using the e.l.f cream eyeliner. 4. Finished off by applying some fake eyelashes to complete the look. 5. Finally I applied some red lipstick using my favourite loreal serum red lipstick. It is a very easy look to do, and to pull off. 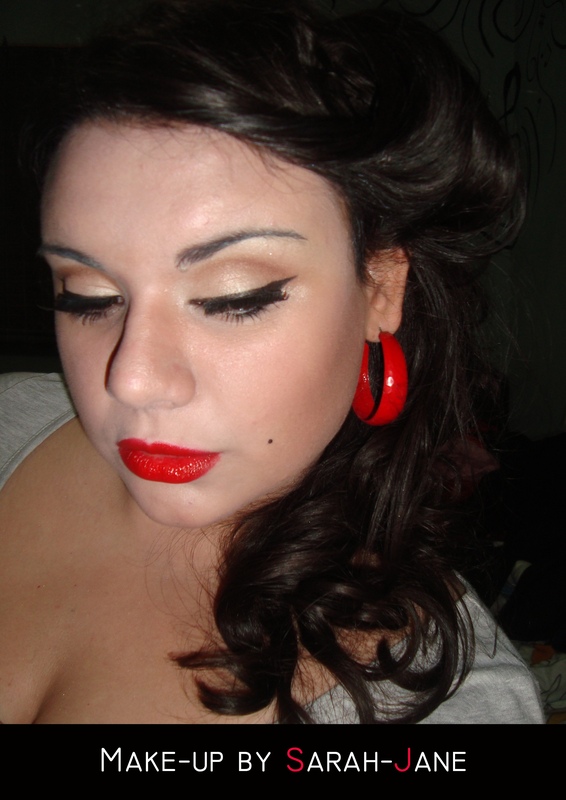 I also tried to style my hair pin up style give the full effect of the theme. 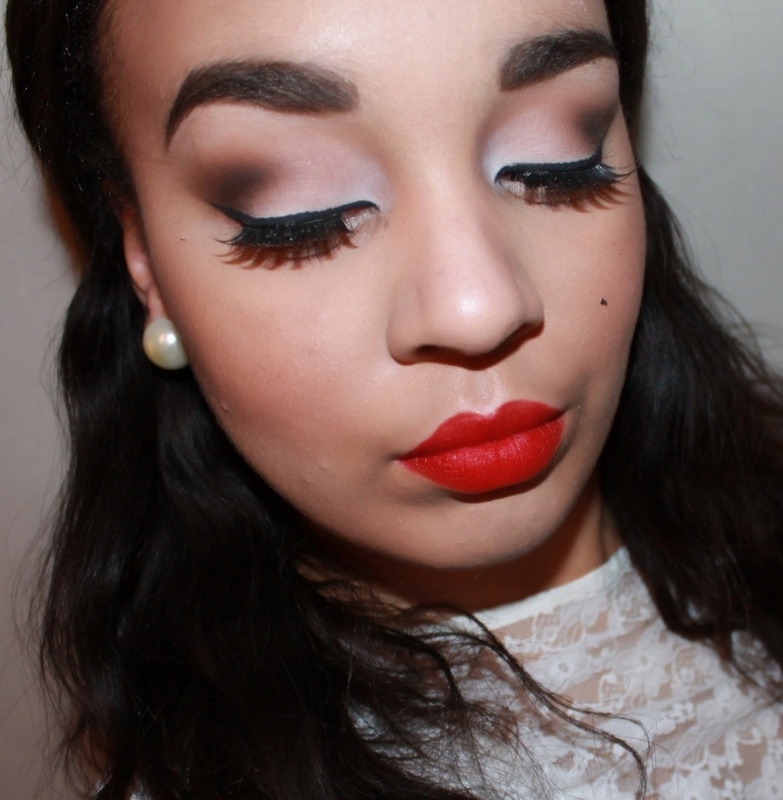 Pin up inspired makeup is one of my favorite style to do and has recently become my go-to look! This particular style requires minimal products and it’s super quick and easy to create! 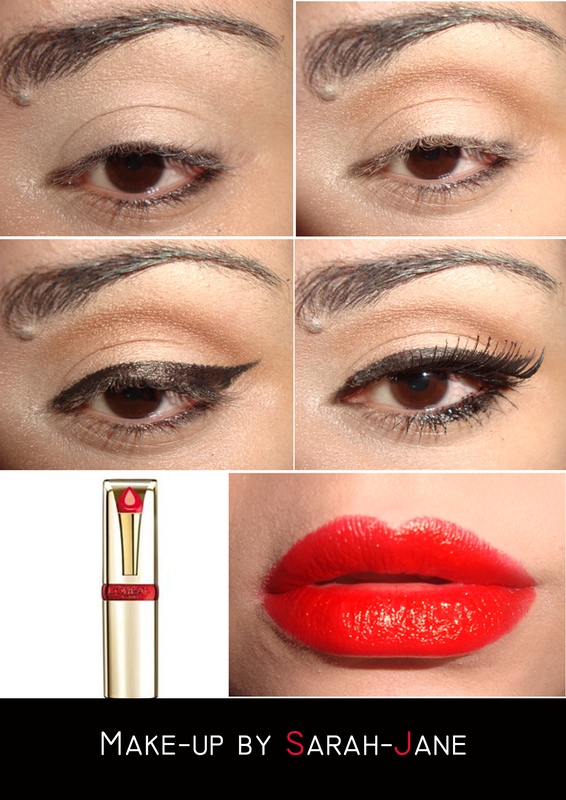 A pin up look is all about the statement lip and the fabulous lashes, which everybody, regardless skin tone, can pull of! 1. Start by prime the eyelid and apply a white eyeshadow in the inner corner of the eye. 2. Apply a creamy/white eyeshadow to the rest of the lid. 3. With a blending brush, apply a skin toned or taupe colored eyeshadow in the crease and blend! 4. Start to define the crease, using a dark brown eyeshadow. 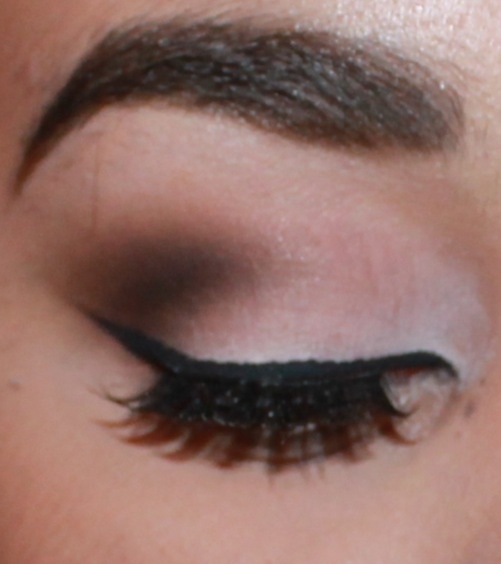 To add some further depth to the look, apply a black eyeshadow to the crease and blend well! 5. Create a thick winged eyeliner and apply some false lashes. Hope you liked our post, keep posted for more! Very pretty & classy. Great job girls. 🙂 I will stop by Sarah-Jane’s blog too. Aaaaah, so pretty and chic!! Very pretty classic makeup, this is one of my favorite looks. YESSSS LADIES!!!! Love this!! 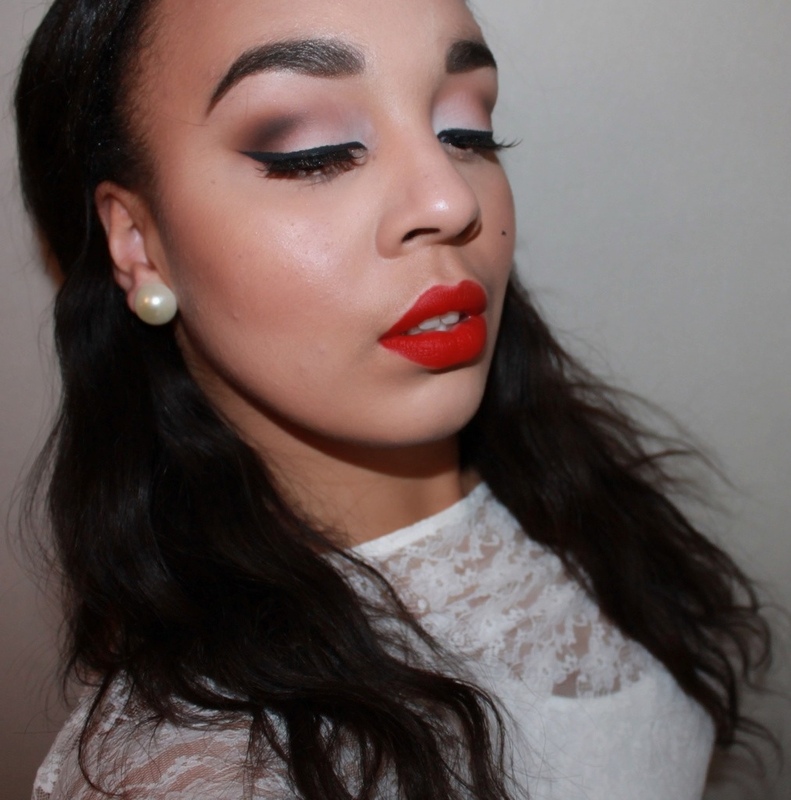 Neutral toned eyes and a red lip! INSPIRED!!! I think I’m going to recreate a similar look! I love you Nicole!!!! You are my makeup hero! This look and the purple one. OMG keep em coming. OMG !!! I love this look so much!! Great Job! both your looks are great! i am in love with this blog, nicole. I have been a makeup artist for years but am having a hard time getting the hang of this blogging thing. your makeup skills plus the styling in all your photos are perfection. looking forward to reading on a regular basis. I LOVE this look! You both look gorgeous and I thank you for all of the how-to photos! Thanks sweetie! I’m glad you liked it!